Singletree Fraser Valley will hold its Spring Release April 14 and 15. Last year their spring release was so popular that this year they are doing it over two days. Everything will be open for you to taste and try including past vintages. Mark your calendar as this is the event not to miss! Cost: FREE and open to all. For more information and the latest updates, visit Singletree Winery on Facebook. April 6, 2018 [Naramata, BC] The Etsell family, owners of Singletree Winery in Abbotsford British Columbia (BC), proudly announce that they have purchased a property in order to open a second Singletree Winery location in Naramata, BC. The property they purchased was formerly called Ledlin Family Vineyards and had been open at 1435 Naramata Road, for less than a year before being purchased by the Etsell family for an undisclosed amount. With some minor renovations to take care of over the coming months first, the Etsells hope to have Singletree Naramata Bench ready to open in time for the summer touring season. They received the keys over the past weekend and were delighted by how friendly and welcoming the Naramata community is already. 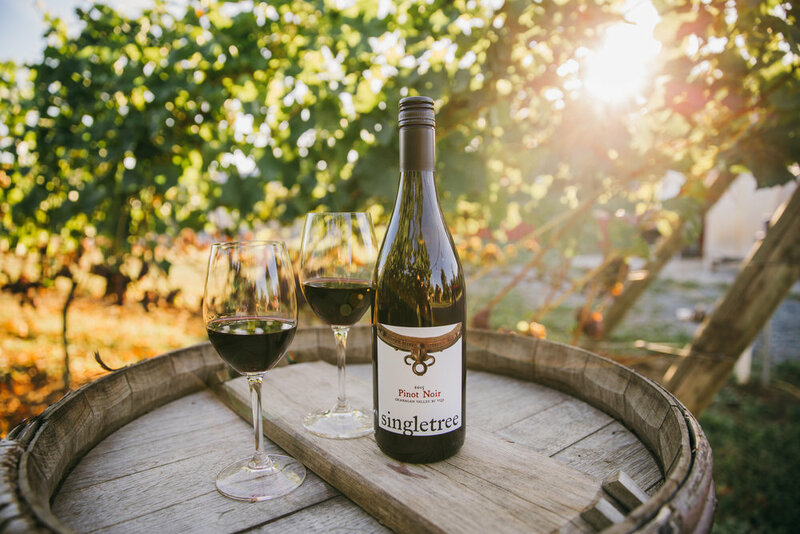 Singletree Winery opened in Abbotsford in 2015 after the Etsells decided to expand upon their family's farming operations and make the move into the wine industry. The winery is named Singletree after the single harness yoke which was an essential tool for pioneering farmers from all over the province. In under three years the winery has established itself as a leader in the Fraser Valley winery community, where they offer a focused lineup of estate-grown wines, and red wines made from grapes grown in Naramata. By purchasing the property in the Okanagan, it allows them to be closer to the vineyards there and also reach wine loving customers in a different part of the province. "It's a thrill to be able to open a tasting room where we acquire some of our fruit already," remarked winemaker and second-generation owner Andrew Etsell. "The reception has been incredible for the fresh, juicy Fraser Valley white wines we produce, and the luscious reds we make from Okanagan fruit," he continues. "We are excited to offer our whole lineup of Singletree wines to Naramata locals, and visitors too." As the family has just received the keys and have renovations to make, there are no current photos of the new property. The winery invites people to follow their journey on social media and to sign up for their newsletter at singletreewinery.com to be in the know for all of the winery's official activities. When the winery opens to the public there will be a ribbon cutting. Media stay tuned for details or contact Genevieve Dufresne or Amy Chen at Town Hall Brands 604-321-3295 for interview opportunities. Singletree Winery Fraser Valley is in the Mt. Lehman area of Abbotsford, and Singletree Naramata Bench opens in 2018. The Etsell family has deep roots in the agricultural community. With careful attention to their land, they are committed to showcasing the best of British Columbia: the Fraser Valley, which provides a lineup of aromatic, crisp, and juicy wines that showcase this unique terroir; and Naramata Bench in the Okanagan, where the glacial soils and warm climate produces luscious red wines. Their portfolio includes Siegerrebe, Sauvignon Blanc, Pinot Gris, Chardonnay, Grüner Veltliner, Late Harvest Kerner, Pinot Noir Rosé, Wild Ferment Siegerrebe, a white blend called Homestead, and Harness, a Bordeaux-style red blend. A traditional-method sparkling wine will be released in 2018. The wines are made by second generation family member Andrew Etsell, under the guidance of consulting winemaker Matt Dumayne. The Fraser Valley winery is open for visitors Wednesday through Sunday, from 12 noon to 5:30pm.